Probably it is during the juncture of the last and the first lunar months the Spring beauty and the rich cultural variety of Assam can be seen fully. The month of April — which represents this juncture — witnesses many multihued festivals. If for some, it is a time to celebrate their cultural festivals, for some others it is a period to observe their religious-cultural ceremonies. It is during this period Poi Sangken is celebrated that generally falls on April 13-15. It is a religious-cultural festival of the Tai, the Tangsa, and the Singpho, the Theravada Buddhist followers who inhabit in Assam and Arunachal Pradesh. Though it is a three-day festival, it spans for a week or so. The pre-carnival period is a very eventful episode for the communities. Aside from cleaning and decking houses, and preparing sweets and snacks, they have to get all the works done beforehand so they can enjoy and perform rituals fully during the festival. Moreover, it is their custom that they should abstain themselves from doing any hard work during the festival. Poi Sangken is celebrated by the monastic and the lay alike. On the first day of the three-day festival, the idol of the Buddha is taken out from the main shrine with the devotees beating drums, playing cymbals, and performing a dance to the tune. In the monastery premises, the Buddha idol is installed on kyongfra (Sankyong in Burmese), a temporary shrine decked with colourful papers. There it is kept for the next three days so the devotees can give a ceremonial bath to the Buddha. This holy bath of the Buddha is a propitious event of the festival. To perform the ritual of ceremonial bath, they specially design a fountain called Lungkong to sprinkle clean water to Kyongfra. Lungkong is made of wood in the shape of a mini boat with a wheel fixed in its center. As the devotees pour water — simple and scented— in the boat, the wheel starts moving sprinkling water over the idol installed in kyongfra. Devotees pour water thrice and they place pots near the idol so the water that has washed the idol spills over them. They collect it as holy water and they believe it helps cure some ailments like a headache. 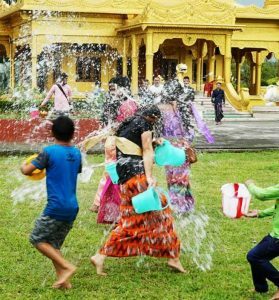 Then they splash water on the monks to invoke their blessings for good luck, good health, peace and harmony throughout the year. They also spray water over all the holy objects including the Bodhi tree (the tree under which the Buddha attained enlightenment), sal tree (the tree under which the Buddha was born and died), and the holy books. They, however, do not pour water directly on the holy books. They attach a long rope with the books and keep the other end to the reach of the devotees so they can splash water on it. It is thus a merit-making occasion. Devotees earn merit through lighting candles and burning joss sticks before the shrine, and offering alms to the monastics, the poor, and the diseased. Again, this festival brings in light the artistry and creativity of this tradition that the devotees display in their decoration of the monasteries and houses. On the third or the final day of the Sangken festival, the devotees (upasak and upasika) take pancha sheel or ashta sheel as per their age and vows. After receiving sheel, they wash hands and feet of the abbot and other monks and offer flowers and gifts to them. The abbot then places the flowers in three different trays and dedicates them to the Buddha, Dhamma, and Sangha. As he does it, he will place a hand fan on the ground to mark a partition between him and the devotees. Then he recites Mangala Sutta. At the end of it, he sprinkles water on the ground and prays: O mother earth, O the god and goddess of earth, please be the witness of the dharma of my donation. After this ritual, they re-install the idol to the main shrine. The festival comes to an end with this event. This day marks the end of the old year and the beginning of the new year. As a residue of this festival, the village communities observe Kapsithi in the evening of the fourth day or later. They build a pyramid-shaped nine-layered shrine called Kapsithi with clay and install it in the courtyard of the village headman’s house or in the premises of the monastery. There is a belief in this tradition that the nine layers signify the nine qualities of the Buddha. They offer alms and pray before Kapsithi for the well-being of the village and villagers. It is followed by a feast. Sangken is found to be celebrated in other countries also. The Buddhist followers of the South East Asian countries like Thailand, Laos, Cambodia, Myanmar celebrate this festival as Sankran or Sankranti with a similar spirit as their Assamese counterpart do. Poi Sangken is thus a cultural as well as a religious festival that marks the farewell of the old year with all the evils accumulated during the previous year and a warm welcome to the New Year. The rituals, particularly splashing water, are meant to attain peace, harmony, and unity, the pre-requisites of harmonious coexistence of all beings.